After Zachariayude Garbhinikal and Happy Journey, Next is 7th Day. Asianet is going to premier the most awaited film 7th Day On 21st December 2014. Its the Latest Malayalam Thriller Film Released in 2014. Prithviraj Playing the role of David Abraham, an ageing IPS officer in this Movie. 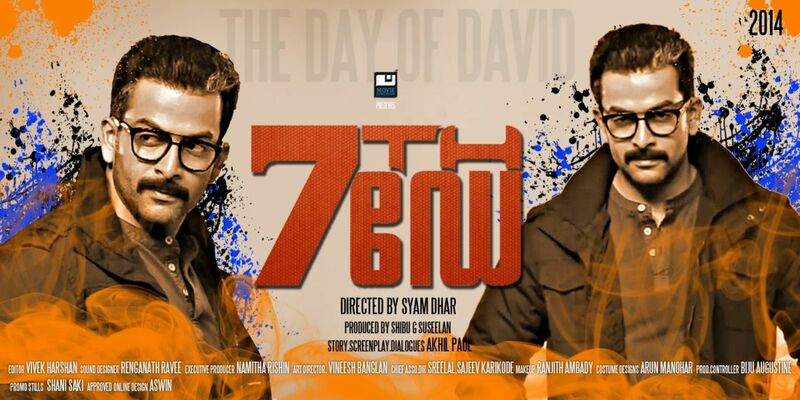 7th Day is Produced by Shibu G. Suseelan Under the banner Movie Junction. Prithviraj , Tovino Thomas, Vinay Forrt, Janani Iyer,Anu Mohan, Praveen Prem, Joy Mathew etc are in the star cast of this Movie. Asianet’s Christmas Films 2014 are Not Finalized yet, Avatharam, Bangalore Days, Ring master etc are Expecting. Please Stay Tuned Keralatv.in for The Christmas Premiers of Asianet, Surya TV, Kairali TV, Mazhavil Maorama, Amrita TV etc.